Washington (CNN) Justice Ruth Bader Ginsburg fractured three ribs after falling in her Supreme Court office Wednesday night, the Supreme Court said in a statement. Ginsburg was not present at Thursday&apos;s investiture of Justice Brett Kavanaugh, Trump&apos;s appointee confirmed last month that gave the court a solid 5-4 conservative majority. 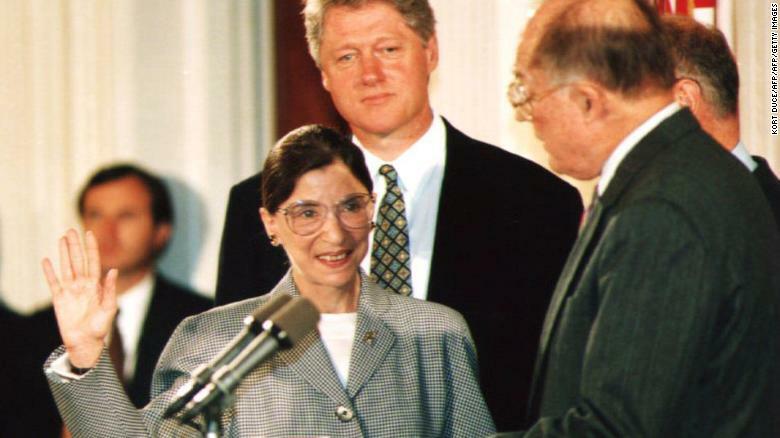 Ginsburg&apos;s health has become the subject of much attention in recent years. "I&apos;m now 85," Ginsburg said. "My senior colleague, Justice John Paul Stevens, he stepped down when he was 90, so think I have about at least five more years." White House counselor Kellyanne Conway said Thursday that Ginsburg is "a very tough woman" and that she&apos;s "praying for her." "I&apos;ve known her for many, many years -- got to see her just a few weeks ago here at the swearing-in of Justice Kavanaugh," Conway told reporters, adding, "I hope she has a full and speedy recovery." CNN&apos;s Allie Malloy, Debra Goldschmidt and Dan Berman contributed to this report.